Black tie event to a simple catered dinner for friends. Food Art comfort foods will delight all of your guests. If you like great traditional flavor these are the Menus for you. Our food is always cooked with love and we use the freshest ingredients that are prepared expertly to your preference. Hors d oeuvre Parties to Buffets. The receiption and buffet presentations will stun you. 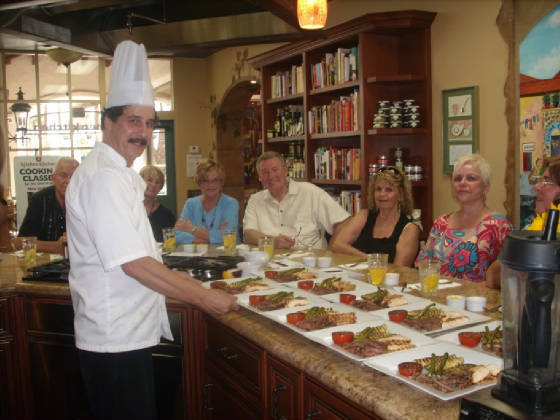 Baked French onion soup, Chicken parmesan and crème brulée for desert or maybe a grilled shrimp with grilled pineapple salsa, Greek salad, carne asada, grilled chicken tortillas, grilled Italian vegetables and a pineapple jalapeno sorbet for desert. These are just a couple of menus that our guests have been raving about. Everything is made from scratch and we always use fresh ingredients. Let us take the pressure off. We can cook and serve or just drop off and hold. Great tasting food that is well presented is a must. Anything on this site can be recreated for your special event. Check out all the wonderful Galleries and the great edible art. Theme centerpieces that personalize your event. Station menus are available upon request. How much money do you Waste each week throwing out food from your refrigerator that you did not use each week because you didn't plan carefully or didn't have time to cook the products? If you calculate the cost of meals, think about all the Time you spend going to and from the grocery store, waiting in traffic and checkout lines after work. Then figure out the time you spend on meal preparation and clean up after. Restaurant Meals are very hihg in price. When you order salads, beverages, and pay a 20% tip. You have absolutely no control on the ingredients used in restaurant, carry-out or home meal replacement food from the grocery store. With a personal chef service, you specify what you want used in your food, such as types of oiis, fat level, salt level, spice level, etc. Gourmet meals ready to heat and eat are more affordable than you may have thought. Food Art Entrees include a side dish. Some entrees list side dishes, but if you do not like the suggested side, then it can be changed. The entrees can be packaged family style (4 servings), or for couples ( 2 packages of 2 servings each), or individually (4 packages of 1 serving each), depending on your specific needs. Packaging - Most meals can be packaged in vacuum seal bags which allows you to pull your meal from the freezer and heat it up in simmering water (boiling bag method), cut the bag open and plate it, so there are no messy pots and pans to clean. Casserole/Oven dishes are prepared in microwave/oven safe disposable containers, so they can be heated in either the microwave or regular oven. Heating instructions are included on the bag or container. The charge for these containers is the cost we pay for them, ie; vacuum seal bags are currently $0.39/bag. include a side dish and heating instructions.